The Value Proposition: Movie vs Book. Let's be honest. When it comes down to it, most decisions are about the bang for the buck. Most people don't think twice about throwing down admission price for the latest blockbuster movie of their flavor of choice. In my area, that's $10 a head for prime time. Of course, the movie experience isn't complete without some kind of concessions, soda, popcorn, candy, hot dog, whatever, at loan-shark prices. Now you're up to around $20 for 2 hours of entertainment, or $10 per hour. Now let's take a novel. The Passage has been hot this year.It's $16 in hardcover at Amazon.com right now, running at 784 pages. Let's say you read a page a minute (which is pretty fast). That's 13 hours of entertainment, or $1.23 per hour. 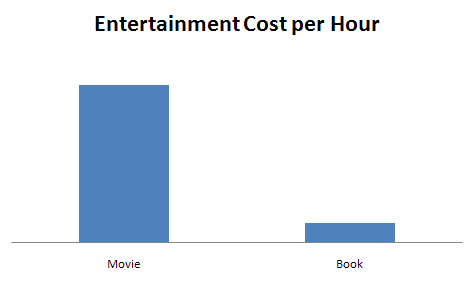 A movie costs eight times more per hour. Eight times. You can get The Passage in paperback or Kindle at $10, running you $0.77 per hour. A movie costs thirteen times more per hour. Are you getting this? You can have 2 hours of movie and only get half of Deathly Hallows for $10 plus rapaciously-priced popcorn in a chair next to a stranger who hogs the arm rest, or have 13 hours of book and get all of Deathly Hallows for $7 plus any food your heart desires at sane prices in the most comfortable chair in your home. Here's the funny thing, the psychology of it. At the movies, you step up to the window and the girl says, "Ten dollars," and you don't blink. At the bookstore, you pick up a book, you see the $16 price tag, and you think, "Really? Sixteen dollars?" and you put it back down. Does anybody else think that's weird? Great points, Brad! I shared on my FB page because everyone should consider this. And that doesn't even count the fact that you can SHARE your book with someone, and you can't do that with a movie! Plus, you can read a book at your own pace - and if you don't get something you're not trying to play catch up, or, if you're watching the movie at home, fumbling for the remote trying to rewind. However, I would debate the value of a book like The Passage compared to a movie. I skimmed most of it so I don't think I got my $'s worth from that one . AND... you can re-read your book as many times as you want to for free - you don't have to wait for it to come to Redbox and pay for the privilege of going there again. Snacks optional.